I am sure each Easyboot user out there has endless stories, good and bad, about booting. 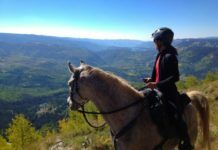 Applying boots each time you go out to ride can be troublesome, especially if you have some of the tight-fitting boot styles such as the Easyboot Glove or Easyboot Epic. Many of us have just adapted to it, making it part of our saddling routine. Others go barefoot as much as possible and only use the boots on rare occasions. For those who want a longer hoof protection, gluing on products is a great option. 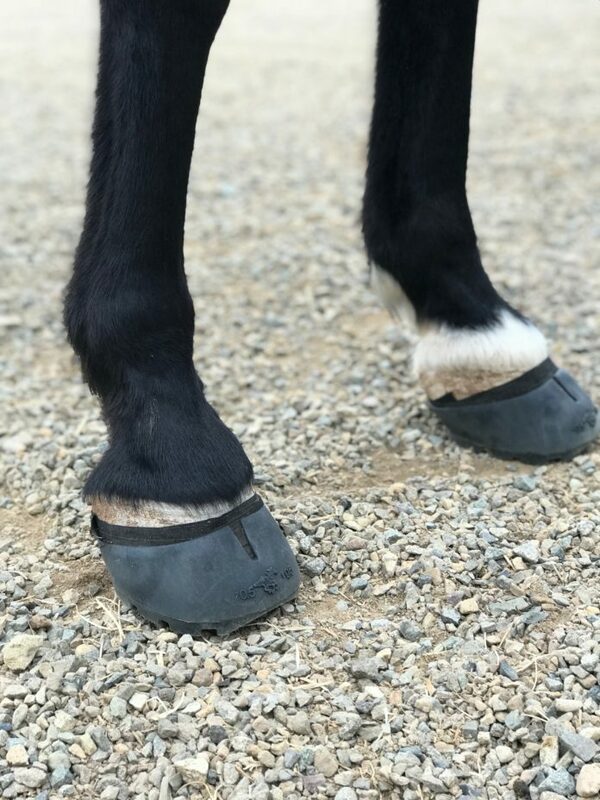 We have a wide variety of EasyShoes to serve multiple hoof shapes and purposes as well as the Easyboot Glue-On and Love Child. However, if you don’t have access to a hoof care practitioner or if you don’t have experience with preparing the hoof for glue, using this method can be more hassle then temporarily booting. There are customers out there who have learned to modify our products to fulfill their specific needs. In this blog, I am going to talk about my experiences with modifying the Easyboot Glue-On using Mueller tape. As the manufacturer, we prefer to stick to strict guidelines on how boots and shoes are used in order to get the best results. But as customers provide feed back on personal experiences, we are able to pass that information along. One of these modifications I have decided to try on my horses. I wanted to be able to say I have seen this method work successfully with my own eyes. Of course, this isn’t an EasyCare recommended modification but it is something that has been successful in a few cases with our customers and I have personally seen success up to this point. In some instances, you want below the hair line contact you get out of a Glue-On product but you don’t want to actually glue it on. 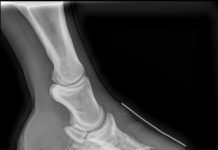 An example could be a two or three-day event, a barrel race, a trail ride, or an event that requires hoof protection below the hairline (dressage/jumping). The design will prevent any rubbing from occurring since it sits below the hair line. A boot would provide protection in this service but let’s just say you don’t want to use a boot in this situation. If your horse’s hoof fits within the measurement of the Easyboot Glue-On you may want to give this experiment a shot. What you will need are a few items: two Easyboot Glue-On shells, Mueller tape, a hoof pick, and a mallet. I started by cleaning out my horse’s hoof. I then applied Mueller tape as shown in this Application of Mueller tape video. 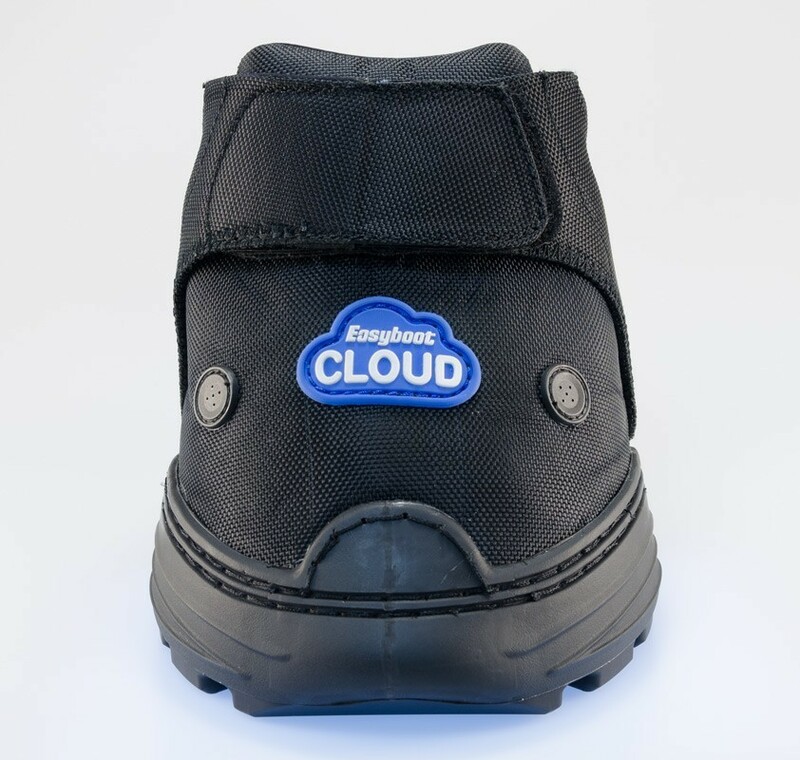 This tape has been proven successful to create a suction with the Easyboot Glove which is the Glue-On with a Gaiter allowing it to become a boot. Here I took the Glue-On shell and placed her toe into the shell and make sure to line it up straight. I pulled and wiggled the shell on as much as I could. Next, I took the mallet and tapped the shell on at the toe and again on the sole to make sure the foot was seated squarely in the shell. I set the foot down to make sure the “V” was spread correctly and the boot looked snug. With the colored shells in the pictures above you are able to see the process clearly. It turned out that those were a half size too small for Pistol at this point in her trimming cycle. There is clearly bulging at the sides of the shells. I did end up taking her out on the trail and I experienced no problems with the shells coming off. However, I ended up ordering the next half size up and have posted those pictures below. You can see a much more comfortable fit in the proper fitting shell. With those shells I applied them the night before the trail ride and didn’t worry about them coming off even once during my trail ride. Although it is only February, it is already time for the barrel racing season to begin. Southern Colorado has had dry weather up to this point so it made it an easy choice for me to decide if I wanted to run in this first race. In the first full week in February there was still hardly any snow anywhere. This made conditioning and preparing my barrel horse Billie the week before more enjoyable. She is barefoot for the winter but she has been experiencing some tenderness. I had been keeping her in the Easyboot Clouds so that she could comfortably move around the paddock. I rode her the week prior barefoot in the pasture so she wouldn’t have to move out on hard ground. But I did want to make sure she had protection for the barrel race as the area outside the arena is all gravel. The day of the race came and, luckily, my Easyboot Glue-On shells and Mueller tape arrived the day before. Before loading her up I applied the shells to her front feet with Mueller tape using the method described above. My original plan was to boot all four feet, but in all best laid plans not all follow through to completion. The size shells I was going to use on her hind feet ended up fitting better on her front feet. Sizing is definitely trial and error with this snug fitting boot. I ended up only booting the front feet. I loaded her up and away we went. Frontal view. The above three pictures were taken by EasyCare Product Specialist, Devan Mills (iPhone 8). Before getting on after tacking up I made sure to take a mallet to the toe area one more time for good measure. I walked and trotted her for a while to allow her to warm up slowly and in hopes of heating the foot up to allow for better traction between tape and boot before my run. My run was a success. She felt like she had good traction in the arena and the Glue-Ons stayed on no problem! It was probably the smoothest run I have had on her, especially at the start of a season. It was a great start to the year! Don't be afraid to get creative and make modifications to make the boots work for you. We would love to hear your stories about how your boots are working for you, whether you try this method or another. You can click here to tell us your booting story! 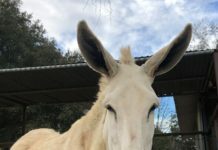 Previous articleSister, the Mule, and her Boots.